The first part of the vet appointment was another under-saddle evaluation. First, I rode him for a few minutes. He did his usual thing with the kicking and ear pinning. Then, the vet blocked his front feet. Then, I rode him again. He was more on his forehand, and stumbled more. At the canter, he nearly went to his knees. The vet did not see any notable changes other than the stumbling (some horses move out better if their feet hurt before they are blocked). Because he was so grouchy about having no food for his scoping, I decided to longe him to see if there was any change in his gait. The vet and I both did see some more freedom in his shoulder and more reach when he feet were blocked. She recommended talking to my farrier about experimenting with pads. After 10 hours of no feed and 6 hours of no water, Wizard was properly prepped for his endoscopy. He was sedated, and then they put the tube up his nose so we could see what was going on in his stomach. The diagnosis? Grade 1 – 1.5 gastric ulcers (on a 0-3 scale). On this page, they sort of looked like the Grade 2 ulcers. The vet recommended treating him for a month with UlcerGard. We decided to hold off on the SI joint injections for now, since we won’t know what helped and what did not if we treat him with too many things at once. And now…. drum roll… The Good News. After 3 1/2 years, I am officially a horse owner again. 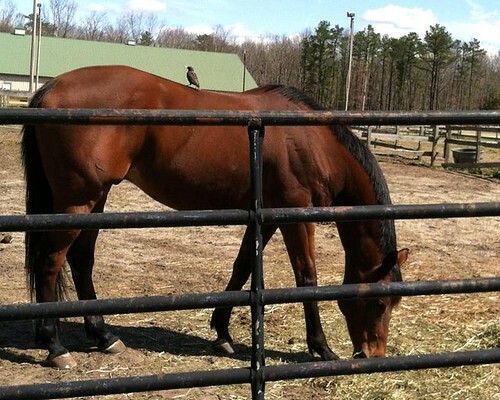 I signed the paperwork and Wizard is officially my horse! After working with him for so long (and for over 300 rides! ), it seemed like the right time. I am so appreciative to Wizard’s previous owner for letting me work with Wizard after I lost Alibar (back when I started this blog!). In order to strengthen his hind end, I made the difficult decision to move Wizard to another barn with more hilly trails. Several barns said that they could not board Wizard because he is a cribber. After doing extensive barn hunting, I decided upon a barn that is next to Assunpink Wildlife Management Area. With over 6,000 acres of trails, we will have more hills than we know what to do with. I will miss my friends at Handy Acres very much. I have close to 5 years of very happy memories there. And so, a new chapter begins. ← Wizard Rides 346; 347, 348, & 349: Did We Miss Anything? Sometimes difficult decisions have to be made… Good Luck at your new barn! That is so true- there is a lot that I will miss about the old barn, but the new one looks to be the best match for our therapy plans. Congrats!! I hope the ulcer treatment helps him a lot, poor guy. Thank you! Me too- he really is a textbook case for them. It also was good peace of mind getting him scoped. I’m guessing I did not do the previous treatments for long enough. I’ll do the full dose for the full 28 days this time. Thank you, Fran! More adventures to come! Yay! It’s been so long that while I knew Wizard wasn’t yours, I kinda forgot. BECG really helped me get through both Flirt and Sugar’s ulcers- two different types at the same time. There is another post earlier on about gastric ulcers as well. And, I’m happy to say, that both my girls are over their ulcers! Thank you- so glad the girls are feeling better! I always love reading your blog even though I don’t usually comment. Just wanted to say congratualtions to you and Wizard!! !